At MCA of Chicago’s Construction Education Institute, we’re committed to providing quality continuing education for field personnel and leadership. 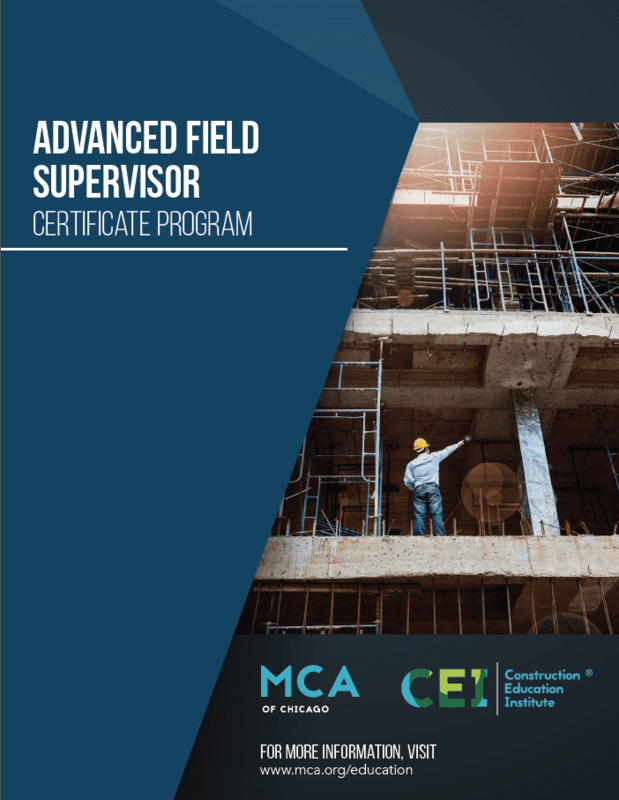 The Advanced Field Supervisor program provides a core curriculum, taught by CEI veteran instructor John Koontz. Each of the four days of core instruction is split into two parts and is designed to provide a student with a crucial aspect of field leadership training. From management and planning skills, to leadership tips and project closeout advice, the core curriculum of the Advanced Field Supervisor program will teach the skills any field supervisor needs to succeed on the job. After the core hours are completed, certificate program students must complete an additional four elective courses in areas of their choosing. These courses are taught by university-quality educators at MCA’s Construction Education Institute and cover a wide variety of skills which students can select to best suit their professional needs. Upon completion of all requirements, graduates of the program will receive a certificate of completion and will have all of the skills they need to be an effective field leader. 2018-2019 Certificate Program cancelled. Stay Tuned for additional programming.